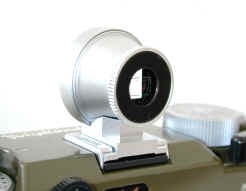 2009 Nickel Version 50/3.5 Heliar Leica Screw Mount IN STOCK! 2017 50/3.5 in Leica M Mount Version IN STOCK! "Superb, all-metal, high-precision collapsible-tube lens mount." "SQF results were excellent -- on a par with the best lenses we have ever tested." "A handy, high-precision, magnificent lens to treasure. It's doubtful that any other commercially made lens will produce superior results." 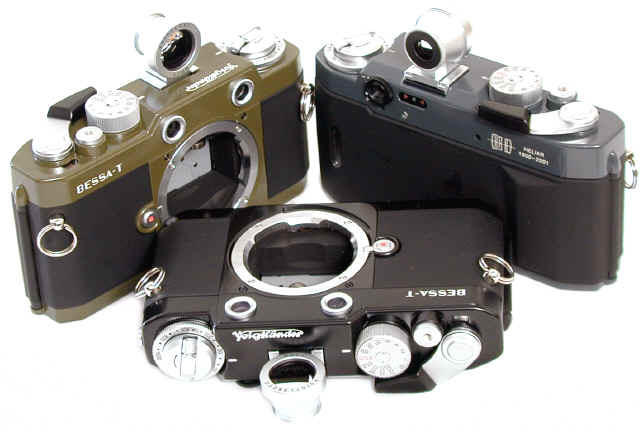 Alas, Voigtlander announced the 50/3.5 Heliar would ONLY be sold with the 101 Heliar sets. 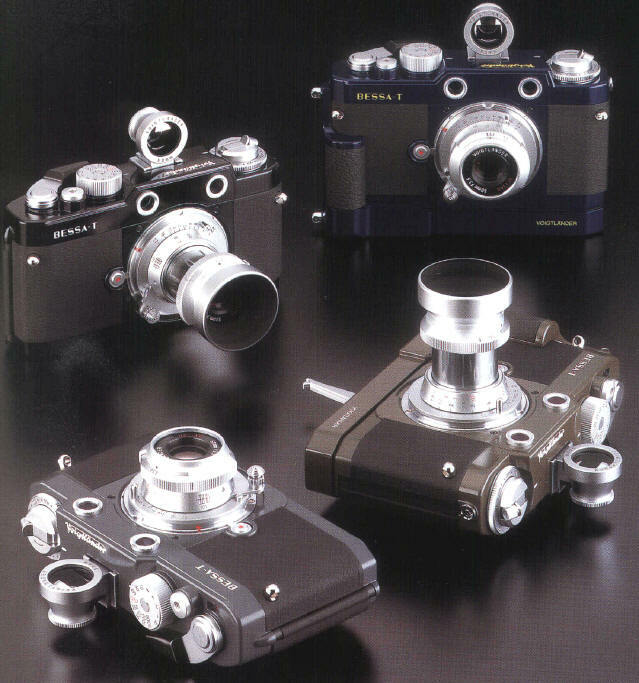 According to Cosina's CEO Mr. Kobayashi, 2000 101 sets were produced. Even the packaging is special for the 101. Shown are the front and back of the 101 cameras, as well as different views of the lenses and finders. 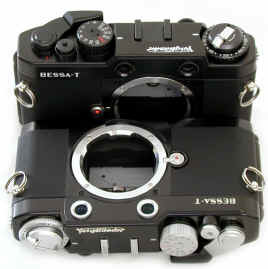 The Voigtlander Bessa T has a special place in Leica M mount camera history. 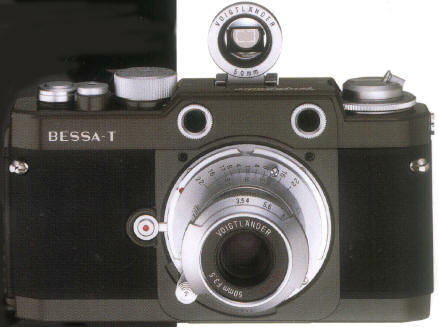 First of all, the Bessa T is a unique camera design utilizing a built in rangefinder without a built in viewfinder. It is the ONLY Leica M mount camera with a built in diopter adjustment for the rangefinder. It is the ONLY Leica M mount camera with a meter readout visible from the top of the camera, making it ideal for low angle and Visoflex applications. 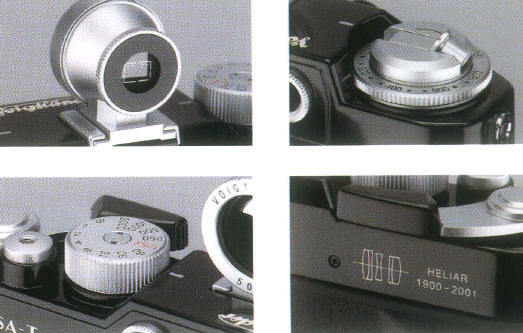 It is the 1st mechanical shutter Leica M mount camera not built in cooperation with Leica. It is the least expensive Leica M mount camera ever made. 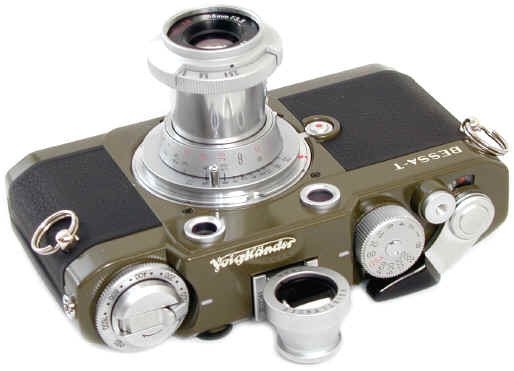 It is the first Leica M mount camera made by Cosina Voigtlander. All in all, not a bad list of achievements for Mr. K's 1st M! 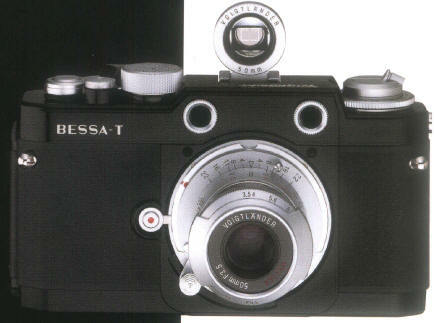 To the right, a standard black Bessa T on the top is compared to the black 101 Bessa. This 1:1 50mm brightline finder is exclusive to the 101 camera. The top deck trim is chrome over brass fittings. 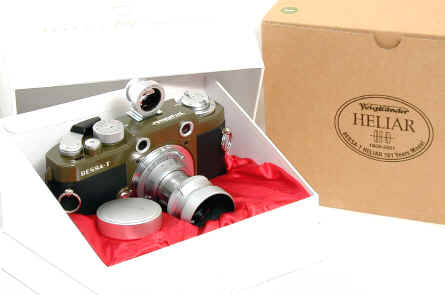 Commemorating the 101st Anniversary of the classic Voigtlander Heliar lens design, Cosina produced not only a new classically designed 50/3.5 collapsible Heliar lens, but also special paint finished commemorative Bessa T's in four different colors: Navy Blue, Olive, Grey, and Black -- with matching rapidwinders ! This is NOT a regular production camera and lens, production is limited. 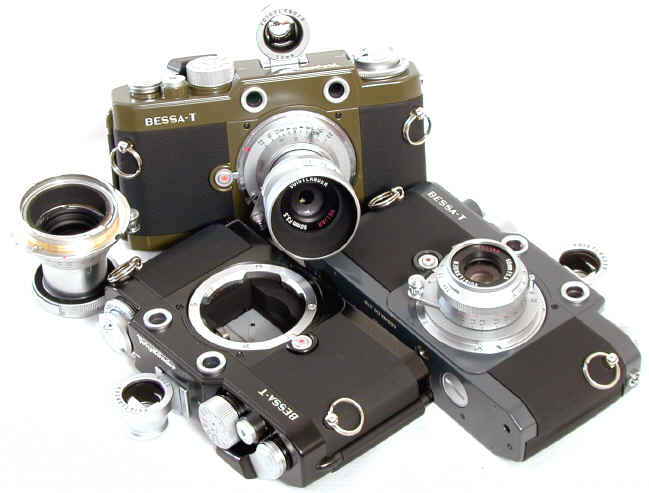 The new 50/3.5 Heliar is planned to be sold ONLY with the 101 commemorative Bessa T. Initial plans called for only 500 bodies of each color, for a total of only 2000 cameras and lenses. However I believe unexpected popularity in the Japanese home market will probably double that sales figure. The top and bottom plates are molded in their respective colors (Gray, Olive, Black, or Navy Blue), and then painted over in the same color, producing a nicely done paint finish. The 101 sets are discontinued after only ONE production run of 2000 units. The wonderfully performing 50/3.5 Heliar was ONLY sold with the 101 sets. The matching color winders were produced in much fewer numbers than the 101 sets. 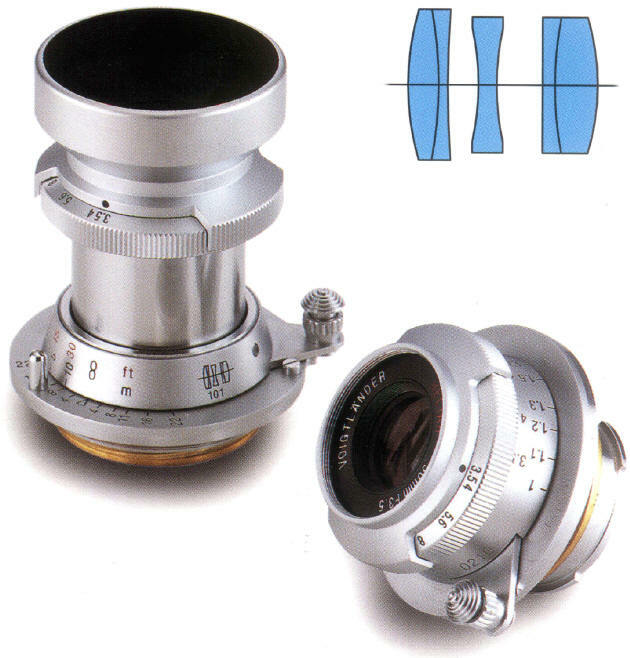 According to Cosina's brochure, this is the ONLY Heliar lens ever made in 50mm focal length. 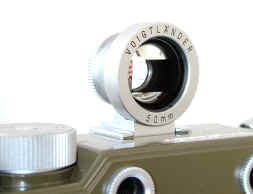 While some Heliars were produced for Voigtlander's medium format cameras in the 1950's, the Heliar five element lens design made its famous reputation for a unique hard/soft image at larger f/stops with large format lenses, not 35mm. At only 150 grams, the new 50/3.5 Heliar may be the smallest, lightest multi-coated 50mm lens ever made in Leica screw mount. Included is the chrome hood and a screw mount to M bayonet adapter to mount it on the M mount Bessa T. This lens looks and feels like it came off a '50s assembly line, with a high quality chrome finish, real engravings instead of stenciled lettering, and the classic 50/3.5 Leica Elmar inspired lens barrel design. COLLAPSIBLE NOTE for Leica M8, M8.2, M5, CL: On my sample cameras, the Voigtlander 50/3.5 Heliar Leica mount lens collapsed safely into the camera bodies of the Leica CL, M8 and 8.2, but not the M5! Note that there are most likely unknown production variations in both the lenses and cameras, so proceed with caution before you inadvertently jam or damage your camera. 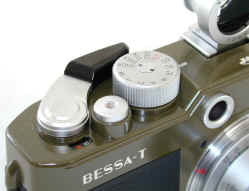 Unlike the standard production Bessa T, the 101 Bessa has chromed brass top deck fittings: the advance lever, shutter release, shutter dial, rewind knob and lever, and the film ASA dial. 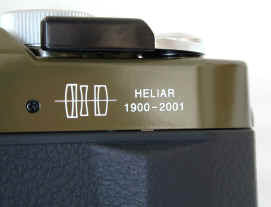 The back top plate is labeled Heliar 1900-2001, along with a section of the Heliar optical design. The new design brightline 50 viewfinder has the ideal full size 1:1 image size. 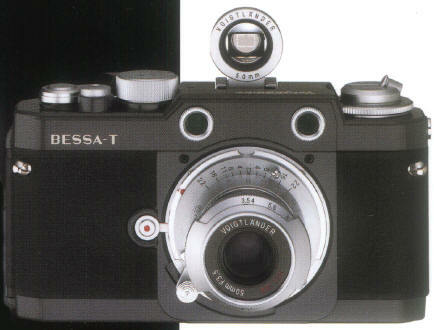 It seems intended primarily for the Bessa T, since the new finder will not fit classic screw mount Leica bodies. Unfortunately the 101 50mm finder does not have the ample eye relief of the regular 50mm brightline. If you wear glasses, the standard 50mm brightline is a better choice. The 101st Anniversary Heliar lens looks like it came right off the assembly line in 1935, look at the obvious influence of Leica's classic 50/3.5 Elmar. Close focus is 1 meter. The f/stop range is 3.5 to 22 with 10 aperture blades for maximum "Bokeh." The weight is 150 grams. 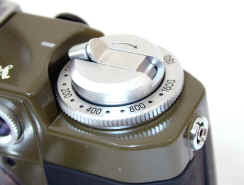 Notice the classic 50 Leitz Elmar type focusing lever, with infinity lock. 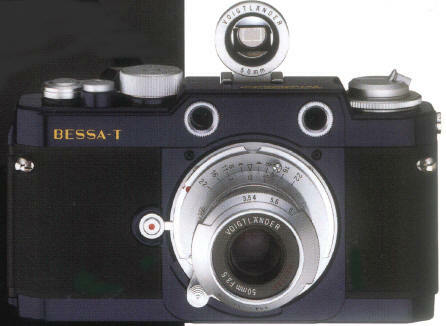 Navy Blue Paint 101st Anniversary Bessa T Heliar, the only T101 of the four colors to have GOLD lettering on the front and top plate. Could blue be Mr. Kobayashi's favorite? In the March 2002 issue of the American Photography magazine Popular Photography, you will find a hands on report of the 101 Heliar set on page 48. Herbert Keppler, camera reviewer extraordinaire, reports "This wild but fascinating super classically styled camera comes in four delicious flavors and has what may be the best lens we have ever tested." "Exquisite lens mount." 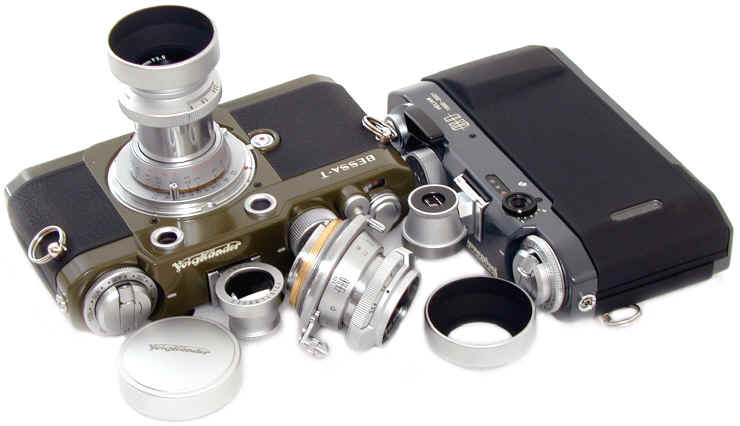 "We were very impressed with the immaculate finish of all parts of the Bessa-T Heliar 101 Years camera, lens, and trigger winder -- certainly a future collector's item." 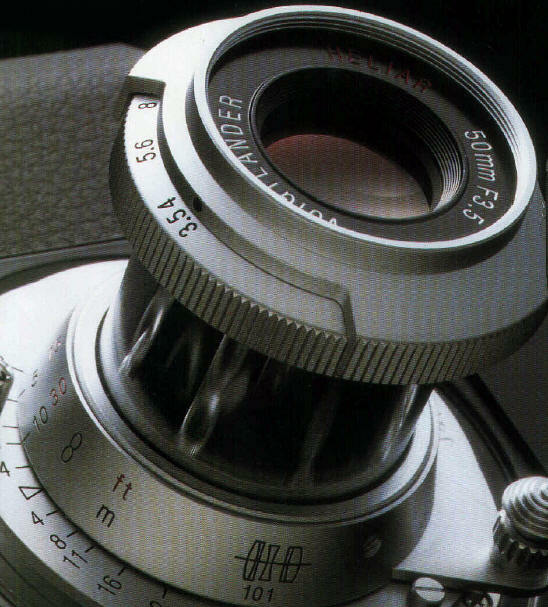 As good as the hands on report was, the 50/3.5 Heliar lens test on page 74 was extraordinary. "Superb, all-metal, high-precision collapsible-tube lens mount." "SQF results were excellent -- on a par with the best lenses we have ever tested." "A handy, high-precision, magnificent lens to treasure. It's doubtful that any other commercially made lens will produce superior results." To put it mildly, such statements about a non Leica or non Zeiss lens are extraordinary. Three cheers for Cosina !! Revised: September 11, 2017 . Copyright � 2001-2013 Stephen Gandy. All rights reserved. This means you may NOT copy and re-use the text or the pictures in ANY other internet or printed publication of ANY kind. Information in this document is subject to change without notice. Other products and companies referred to herein are trademarks or registered trademarks of their respective companies or mark holders.